There's a general understanding that if you pay a few hundred dollars a night for a luxury hotel room, it's going to come along with some perks. Without fail, that means clean bedding and towels, basic amenities like soap and shampoo, and, assuming it's a property that isn't looking to nickel and dime customers, free wireless internet access. Beyond that, you might come across some other goodies. Some hotels have wine tastings, cocktail hours with free food and drinks, wine and cheese waiting in the room, or an included breakfast buffet, particularly if you booked a bed and breakfast package. 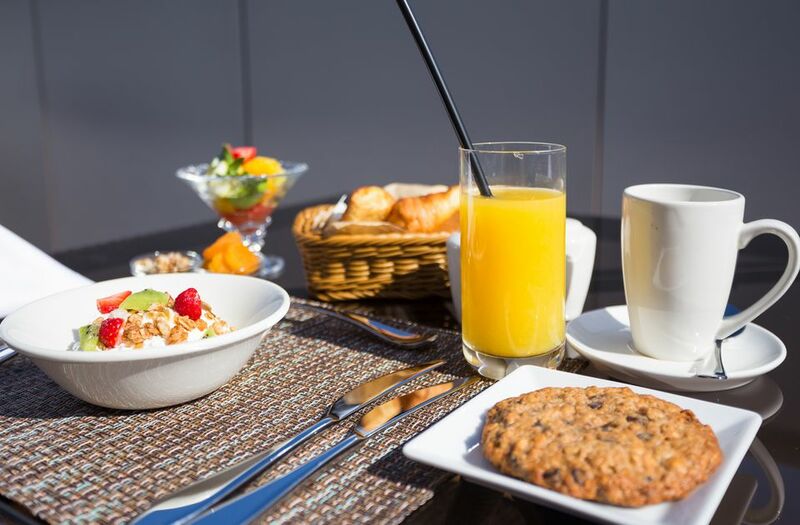 You might be able to get a free breakfast for two guests even if you didn't book an eligible rate at a hotel that offers a complimentary buffet option, though, by achieving elite status with the hotel chain. During the recession, hotels began including breakfast for their top-tier guests as an added incentive to book a stay, particularly when a business expense account isn't covering the bill, such as when you're adding on a night or two before or after a work trip, or traveling exclusively for vacation. Fortunately, the perk remains, though you do need to stay a certain number of nights each year to be eligible to take advantage. Hilton customers that stay either 20 times or 40 nights during the previous year, those that earn 75,000 HHonors base points, and those that have the Hilton HHonors Reserve card or the Surpass AMEX card will earn Hilton Gold status for the period of one year. Along with basic room upgrades at check-in, based on availability, elite members can choose from 1,000 points or a complimentary continental breakfast at Conrad, Hilton, or DoubleTree hotels, or 750 points or a free hot cooked-to-order breakfast at Hilton Garden Inn. Platinum members are also eligible for this benefit. After you stay 25 times or 50 paid nights at any Hyatt hotel, you'll be eligible for the chain's highest elite level, Diamond Gold Passport. You'll get perks like confirmed suite upgrades at booking, free internet, and access to the Regency or Grand club, where you'll be able to take advantage of snacks and drinks in the evening and a continental breakfast each morning. Alternatively, in hotels without a lounge, you'll get a free full buffet in the restaurant, or, at some properties, free breakfast delivered to your room, making Hyatt's program the most generous of the lot. Marriott Rewards members who stay 50 nights each year will earn Gold status. Members at that level will receive lounge access at JW Marriott, Autograph Collection, Renaissance, and Marriott hotels, where they'll be able to take advantage of a free continental breakfast each day. Other Marriott hotels don't include this benefit, unfortunately, though some, such as Residence Inn, offers free breakfast for all guests. Platinum members are also eligible for free breakfast in the lounge. At Starwood Hotels, guests who stay 25 times or 50 nights (including award redemptions) earn Platinum status, which comes along with free continental breakfast at any hotel. The benefit varies from property to property, but many, particularly those in Asia and Europe, let you have the full buffet for free, and some even cover entrees ordered off the menu. There's no room service option, unfortunately, so if you want breakfast in bed, Hyatt's the way to go.